What if the weather forecast is not looking good? On the morning of each ride if the weather is terrible with either heavy rain, lightening, dangerous winds or scorching heat we will discuss this with our customers and arrange an alternative plan. Can I trot or canter if I am with a group that has beginner riders? 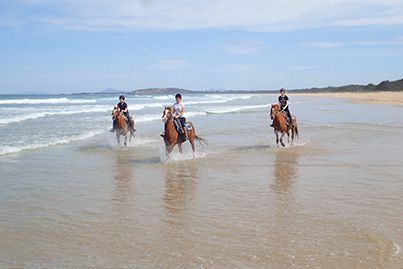 Yes, once we have established each rider’s individual capabilities we then allow for this to happen in a controlled manner, our horses are not typical ‘nose-to-tail’ trail riding horses and are independent thinking horses and are not overly herd-bound. Do I need to pay a deposit and what if I cancel? Deposits - No, all payments are to be made in full prior to each ride either via BSB with an email receipt sent to riding@hwhstables.com.au or by cash payment on the day of the ride. Cancellations - We kindly ask that our customers let us know as soon as possible if they must cancel their booking, a 50% cancellation fee will apply to all cancellations made within 24hrs of the booking, and a 100% cancellation fee will apply to cancellations made on weekends and peak holiday periods within 12hrs of the booking. Can I take my own camera or use my mobile phone while riding? 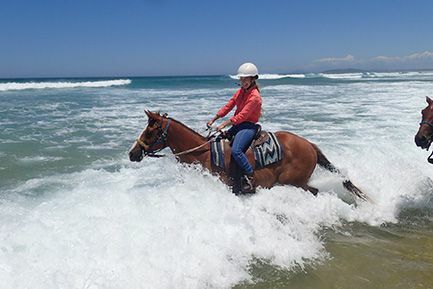 We kindly ask all guests to allow your guide to be your photographer during each ride, this ensures each rider is concentrating on riding and remains as safe as possible. All photos are provided as a complimentary service and uploaded to each customers Facebook via a private account, or for an additional fee all photos can be emailed to a private email. Are there toilets at the Beach Meeting Point location? No, however they are close by within the Jetty Foreshore parklands. For comfort and safety we recommend enclosed shoes or preferably riding boots with long pants. We will provide the safety helmet and we also keep a supply of riding boots. During the heat of summer, it is acceptable to wear shorts for the shorter rides and especially if the customer is only planning to walk their horse. 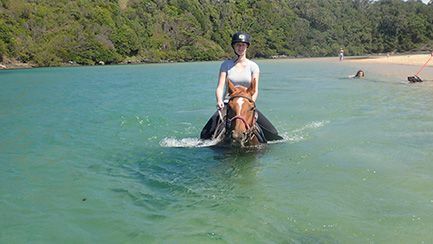 We suggest a change of clothes and shoes for all Beach, Lagoon & River Rides where swimming with your horse is an option. 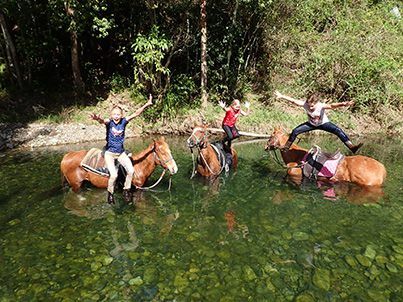 For more information please do not hesitate to contact us on 0419 977 542, and we look forward to hosting you on your next horse riding adventure! Are your horses Hendra Vaccinated? Yes, all of our horses are vaccinated and provided annual health checks.